Hemangiosarcoma: This form of dog cancer is an incurable tumor of cells that line blood vessels, called endothelial cells. Although dogs of any age and breed are susceptible to Hemangiosarcoma, it occurs more commonly in middle aged or elderly dogs. Also certain breeds have a much higher incidence including Golden Retrievers, Labrador Retrievers and German Shepherds. For this reason, we may recommend additional screening these breeds after age 5. This form of dog cancer develops slowly and is essentially painless, so clinical signs are usually not evident until the advanced stages when the tumors are resistant to most treatments. Less than 50% of treated dogs survive more than six months, and many die from severe internal bleeding before there is an opportunity to institute treatment. Lymphoma: This form of dog cancer can affect any dog of any breed at any age. Most of the time, it appears as swollen glands (lymph nodes) that can be seen or felt under the neck, in front of the shoulders, or behind the knee. Occasionally, lymphoma can affect lymph nodes that are not visible from outside the body, such as those inside the chest or in the abdomen. This can cause trouble breathing and digestive trouble. Generally this form of dog cancer is considered treatable if arrested in its early stages. Standard Poodles, Golden Retrievers, Labrador and Australian Shepherds are a few of the breeds with higher incidence of lymphoma. Bladder Cancer: Some breeds are more at risk for this form of dog cancer than others. This is a slow developing dog cancer, and symptoms may not show for 3 to 6 months. Urinary obstruction, recurrent infections and bleeding are common symptoms. Melanoma: This form of dog cancer most commonly occurs in canines with dark skin. Melanomas arise from pigment producing cells called melanocytes, which are responsible for coloring the skin. Melanomas can occur in areas of haired skin, where they usually form small, dark (brown to black) lumps, but can also appear as large, flat, wrinkled masses. Malignant melanoma, which develops in the mouth or in the distal limbs (usually the toenail beds), is an incurable disease. These tumors have very often spread to distant parts of the body by the time they are first noticed, making complete surgical removal usually impossible. Testicular/Prostate: This form of dog cancer is common in unneutered dogs with retained testes. This form of dog cancer is largely preventable with neutering, and curable with surgery if arrested early in the disease process. Owners most commonly find a tumor on their dog while petting or bathing. 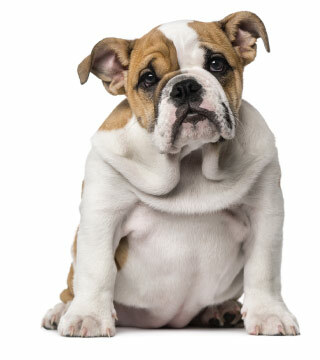 If you are running your hand over any part of your dog's body and feel a lump, call to make an appointment with your veterinarian. Most likely, the veterinarian will want to do a needle aspirate to get cells from the tumor to get a diagnosis on the type of tumor. The diagnosis is helpful in determining what, if any, type of surgery and/or follow up cancer care may be necessary. Some tumors in dogs cannot be visualized but can be palpated (felt with touch) by your veterinarian during the exam. For instance, an enlarged spleen may be palpable to your veterinarian but not visible to the owner. You can reference the list of canine cancer symptoms above to get a better understanding of what symptoms to be on the lookout for.